Whoever tho ught a teacher could be so fun, engaging, smart, comedic, and a powerful influence, all at the same time? 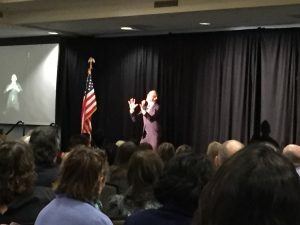 Ron Clark entertained a group of 400 at the Leadership Howard County Big Event at Turf Valley. He did so in the most unconventional ways, to include jumping onto a table, going out into the audience, and dancing his way across the stage while speaking. There was not a member of the audience who did not react to him in some way. 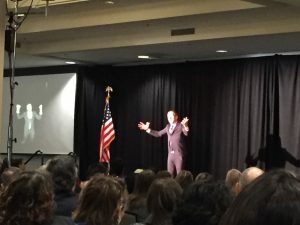 At his heart, which appears to be a big heart, Ron Clark set out to make a difference in education. He formed the Ron Clark Academy, for middle school students in Atlanta, which has become a model for educators throughout the country. His philosophy: hold students accountable, do not teach to the lowest common denominator, acknowledge success, and do not coddle. He has, by all accounts, revolutionized teaching methods. The scene before Ron Clark took the stage was also amazing. 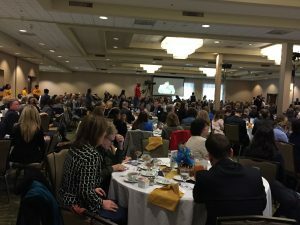 Hundreds of Leadership Howard County graduates and current students gathered. It was so noisy you could hardly hear each other talk. But, we talked anyway. It is always a challenge to quiet that group and get them seated so a program can begin. This is a group that really enjoys each other’s company. 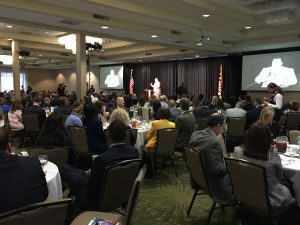 Leadership Howard County is the best professional development pursuit I have ever done in my 36 years of practicing law. The relationships endure, and no matter where I go, I run into someone from Leadership.